Although there have been anti-fracking campaigns for the last few years, it's only now that the public are really sitting up and taking notice. What is fracking? Fracturing rock with pressurised water to release the gases. Why is it bad? Ruins the environment, pollutes water courses, puts our water bills up and lines the pockets of the investors - all sanctioned by our government with sprinkles on top. It's not just us crusty environmentalists that are up in arms over this, middle England are crying out in protest too. Below are links to various sources of information. Sign every petition you can to oppose fracking; write to your MP's, MEP's and the Prime Minister saying 'NO!' to fracking. The Warband is opposed to fracking, many of it's members are active in protests independently. Did you know that you can sign up to an energy provider that hasn't got it's big toe in the fracking industry? Check out unfrack.me for a list of companies that offer really competitive energy prices and do not have any ties with fracking. 1. Your government seriously misjudged the concern people have for their environment when the public woodlands sale was mooted. It was very wise to back off from that project quickly. 2. The same story is repeating itself with fracking. Although people like money, when the chips are down they don’t want their countryside ruined, their roads clogged with lorries, their water and air risking pollution. They want to protect their country – if necessary from the government who promised to be the ‘greenest ever’. Remember your party has 130-177,000 members, the National Trust has 3.8 million. People really care about the countryside. 3. Offers of a million, or more correctly a hundred thousand pounds, do not seem attractive to most people. They smack of desperation, and the need to bribe a community. If you will forgive the image, it looks like a man offering sweets to children while his friends nip round the back and tip chemicals in the soil. 4. The tax breaks for fracking companies – from a PR point of view this is a disaster. The public associates tax breaks with attempts to shore up ailing industries. It gives the wrong signal, and people are starting to realise that this highlights the investment risks – that profitability is not guaranteed. Its timing is also disastrous – just as people are becoming aware of the tax-dodging by big corporations, they see that the tax payer will be effectively funding the degradation of their environment. It’s not too late to back away from this. If you do, saving face by saying ‘We have listened to concerns’, setting up enquiries etc., and then ensuring it never happens, the British people, and history, will perceive you not as weak, but as a champion, a defender, of the landscape of Britain. If you continue to support fracking, your popularity will wane, at the first sign of problems – earth tremors, chemical spills, damage of any kind – you will lose support massively, will lose the next election, and be remembered as the man who was so weak he gave in to financial interests and the man who didn’t care about the land he was supposed to be governing. Do please assure me that you will be taking the former rather than the latter course. The Church of England has told parishioners that fracking causes environmental problems and risks lasting harm to “God’s glorious creation”. Fracking caused earthquakes in Lancashire. The church's decision to highlight potential downsides of fracking comes as Conservative ministers step up efforts to sell the technology to voters as an economic necessity. Fracking, which involves fracturing rocks deep underground with water and chemicals to extract oil and natural gas, has sharply cut US energy bills and imports. Ministers say it could do the same for Britain, but campaigners and local residents are opposing fracking in several counties, warning that it does environmental harm. The leaflet does not explicitly commit the church to a clear position for or against fracking. But its focus is on the potential for lasting environmental damage and urges believers to consider their Christian duty to act as "stewards of the earth". It says: "The time we spend thinking, praying and acting now to protect our drinking water, and the rest of God’s glorious Creation cannot compare with the time succeeding generations could potentially spend trying to make good what will likely happen if we in the church remain uninformed and silent." Fracking is untested and potentially harmful, the leaflet says: “A relatively new technique to extract natural gas from previously unreachable depths is prompting a rush to drill, despite virtually no history as to its environmental impact." The leaflet does mention economic arguments for fracking, but hints that environmental concerns should trump the "temptation" to make such gains. The prospect of profit from fracking “has lured landowners to sign or contemplate signing leases to drill on their land. This is one way they can retain their land and make money, and money in today’s world seems to count for more than environmental stability,” it says. A spokesman for Blackburn Diocese said that the leaflet was intended to inform parishioners about the complex issues involved in fracking, and not to persuade them to oppose the technology. “Whilst the Church of England does not have an official line in any of these particular aspects of the debate, it, together with other faith communities, does have an obligation, under God, to bring a different perspective into the debate,” he said. David Cameron has pledged to make the case for fracking in all parts of the UK, but the cause has encountered resistance in Northern Ireland. Mark Durkan, the environment minister in Belfast’s devolved administration, has said that the case for fracking has not yet been made. Mr Durkan, who would have to approve any fracking project in Northern Ireland, said he was not yet convinced. Eight defendants are charged over protests taking place against energy firm Cuadrilla, which is testing for shale gas in the areaEight people have pleaded not guilty to causing disruption during protests against fracking. 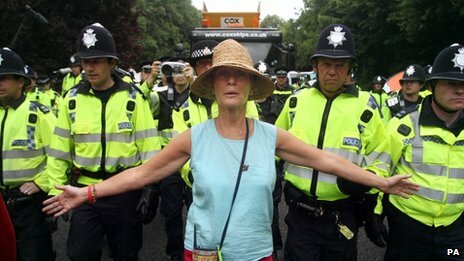 The defendants are charged in connection with more than two weeks of campaigning in Balcombe, West Sussex, against the energy company Cuadrilla, which is testing for shale gas in the area. Fracking involves the pumping of high pressure liquid deep underground to split shale rock and release gas, which according to opponents could potentially cause water contamination, small-scale earthquakes and environmental damage. Teacher Frances Crack, 31, from Cardiff; Samantha Duncan, 29, from Brighton, East Sussex; circus employee Ezra Lynch, 31, from Lewes, East Sussex; Mark Mansbridge, 51, a voluntary charity worker from Lewes; Richard Millar, 29, from Brighton; Justin Preece, from Mid Glamorgan; Nancy Walker, 25, from London; and Marcin Swiercz, 35, a handyman from London, are all charged under Section 241 of the Trade Union Labour Relations Act with attempting to stop drivers and other workers from accessing the site on 26 July. They are alleged to have placed a log in the road, blocking access to the site, and refused to move it, the court heard. The defendants were joined by about 30 supporters in the public gallery and dozens outside at Crawley magistrates court. Prosecutor Brian Noel asked for the case to be adjourned until 2 October, when a district judge will be available to preside over proceedings. Lydia Dagostino, defending, asked that all those charged be excused from the next court hearing. She said: "There are other defendants coming up this afternoon and in the coming weeks on 21 and 28 August. "It will become unmanageable if we have 30-plus defendants in court." Sussex police and the Crown Prosecution Service asked magistrates to impose a bail condition on all defendants banning them from entering the parish of Balcombe, except when travelling through the area on the London to Brighton railway line. PC Michael Wyborn said police had become aware of a climate camp planning to move to the Balcombe area from the north of the country. He told the court they were expecting an influx of between 250 and 1,000 people. He said: "They intend to hold a general meeting in the Balcombe area and tend to publicise their causes by media." Dagostino said: "These conditions are completely disproportionate and oppressive and a clear breach of the right to protest." The case was adjourned until after lunch. Campaigners against the use of fracking are calling on opponents of the gas drilling scheme near Bristol to travel to Balcombe – the Sussex village at the heart of anti-fracking protests. Fracking involves drilling into rock and pumping in liquid at high pressure to split it, releasing trapped shale gas which is collected for fuel. Welsh firm UK Methane is hoping to get planning permission for a production facility at Hicks Gate, near Keynsham, to look for coalbed methane. 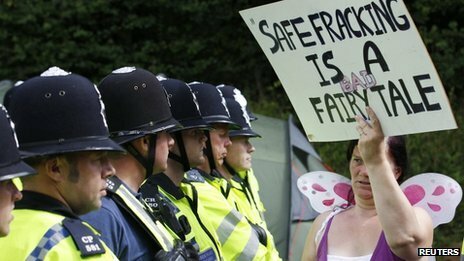 But Frack Free Somerset is hoping to organise a campaign against the controversial method, and is organising opponents to travel to Balcombe this Sunday. The move comes after the prime minister yesterday urged the UK to back fracking, saying the country needs to share in the energy benefits and need not worry about environmental concerns. Writing in the Daily Telegraph, David Cameron said: “I want all parts of our nation to share in the benefits: north or south, Conservative or Labour. Fracking has transformed the energy market in the United States, cutting costs for households and businesses, and ministers hope for a similar effect in the UK. Mr Cameron said it had “real potential to drive energy bills down” and insisted the government was not “turning our back” on low carbon generation but needed to secure a mix of energy sources. 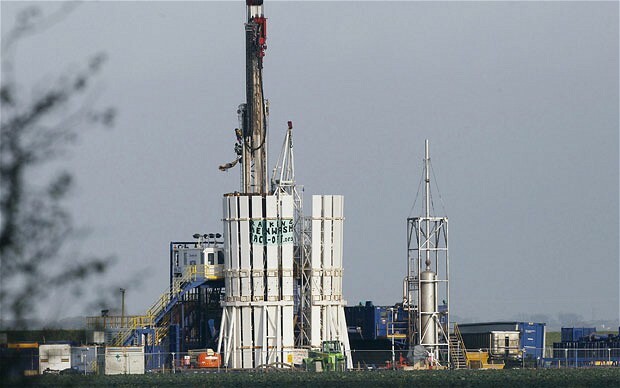 But Frack Free Somerset said the evidence from a Friends of the Earth study showed the shale gas extracted by fracking could at best only represent 2-3% of the European gas demand in 2030, and could be up to three times more expensive to develop compared to the US. It added that, in the US, cheaper gas prices had come about because the recession has caused lower demand for energy, and there was a glut of gas depressing the market. Villagers from an area in West Sussex where protests have been taking place against oil exploration have walked to meet the campaigners. The demonstration in Balcombe is now in its 10th day but energy firm Cuadrilla began drilling at the site on Friday after being held up by the protests. More than 100 Balcombe residents walked from the village to the protest site. Helen Savage said: "Local villagers wanted to meet the protesters. "Overwhelmingly we are against fracking and it is important to get our views across. "We want our land to remain frack-free." It was billed not as a protest march but as a weekend stroll. One of the villagers said that Balcombe was typically middle England. They even sang their own version of 'Jerusalem' as they walked down to the protest site. One villager joked that all that was missing was the cream and scones. There are some voices raised against the semi-professional protesters on their doorstep. But the villagers who marched today say 85% of Balcombe's population of roughly 2,000 are against fracking - even though the drilling at the moment is conventional and exploratory. Most of them say they are not "Nimbys" - they say there's no justification for fracking anywhere in the UK. There have been no arrests on the site so far on Saturday, and the BBC's Andy Moore described the mood on site as "good natured". Charles Metcalfe, a TV wine expert who lives in the village, has formed the No Fracking in Balcombe Society with his wife. He said: "As far as I'm concerned, I'm a Sussex resident who thinks this is a poisonous process which will do us a lot of harm and not a lot of financial good." A survey carried out by No Fibs claimed 85% of local people were opposed to Cuadrilla's operation in the village. Katy Dunne, who lives in Balcombe and organised the survey, said: "We spoke to every household in the village and the overwhelming majority of people who live in Balcombe don't want fracking. "We've done petitions, over 800 of us responded to the Environment Agency's consultation, the parish council has come out against and now we can say with confidence that the residents don't want it. "We've been backed into a corner and we now feel we have no option but to take matters into own own hands and protect our village." A 22-year-old man from Bexhill was also arrested after a police officer was hit in the face with a placard, officers said. More than 30 people have been arrested since last Friday, mainly on suspicion of obstructing deliveries, including the daughter of Kinks star Ray Davies and Pretenders singer Chrissie Hynde, Natalie Hynde. The 30-year-old glued herself to her boyfriend, veteran environmental activist Simon "Sitting Bull" Medhurst, 55, to form a "human lock" at the site entrance on Wednesday. The firm has said it would need fresh permission to carry out fracking. In a move branded a "disgrace" by Friends of the Earth, Chancellor George Osborne unveils tax breaks for fracking in a bid to create the "most generous" regime for shale gas in the world. A new shale gas allowance will more than halve the tax rate for onshore shale gas production, or fracking, from 62 per cent to 30 per cent. Mr Osborne said: "We want to create the right conditions for industry to explore and unlock that potential in a way that allows communities to share in the benefits. "This new tax regime, which I want to make the most generous for shale in the world, will contribute to that. I want Britain to be a leader of the shale gas revolution." But opponents warn that the process for extracting shale gas, by hydraulic fracturing rock with high-pressure liquid to release the gas, or "fracking", can cause earthquakes, pollute water supplies, blight the countryside and affect house prices. The government also plans to give £100,000 per well to local communities affected by fracking and 1 per cent of revenues if the drilling proves to be commercially viable. The backing from the Treasury comes after a recent report from the British Geological Survey revealed there was twice as much shale gas in the north of England as previously thought. Other areas of the country could also be exploited for the gas. But it is still unclear how much of this shale gas could be extracted. Ministers believe the experience of the US, which has seen a shale gas boom, shows it could boost tax revenues, create jobs, reduce energy imports - which have reached record highs in the UK - and bring down household fuel bills. New planning guidance on shale gas is set to be published by the Communities Department as the government attempts to drive forward exploration. Questions have been raised about how much of an impact the efforts to develop home-grown shale resources will have on household energy bills. Environmental campaigners have also warned a new "dash for gas" will undermine efforts to develop clean energy, cut emissions and create green jobs and growth. Andrew Pendleton, Friends of the Earth's head of campaigns, said: "Promising tax hand-outs to polluting energy firms that threaten our communities and environment, when everyone else is being told to tighten their belts, is a disgrace. "Ministers should be encouraging investors to develop the nation's huge renewable energy potential." Greenpeace energy campaigner Lawrence Carter said: "The chancellor is telling anyone who will listen that UK shale gas is set to be an economic miracle, yet he's had to offer the industry sweetheart tax deals just to reassure them that fracking would be profitable."